Last night after a heavy routing training session for the PTA WUG admins, Blaze and BazzDaddy where comparing notes between Iphone and Nexus One. Or rather what can yours do that mine cannot do! 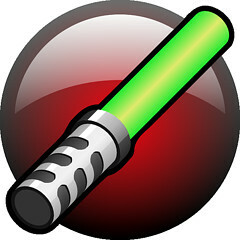 Look, most of the stuff are gimmicks, but the one that was really cool was the Light Saber app. Or should I rather say BazzDaddy's impression of Luke Skywalker slicing Blaze up with his lightsaber. So I had a look around and found the Nokia Symbian version of the same app, for free. Head on over to http://graho.wordpress.com/ and download the free little app and loose a couple of hours in the office, slicing some colleagues in half!